Play through all eight movies with voice and motion-controlled minigames. Harry Potter's legend has been told twice-over now following the completion of both the book and film series, but that isn't stopping Warner Bros. from visiting the universe once again in the recently announced Harry Potter for Kinect. Planned for a fall release, development is being handled by Eurocom, the team behind the Goldeneye remake and Disney Universe. A teaser trailer accompanying the game's announcement shows the player being invited to Hogwarts via an owl-delivered letter. Those wishing to fill Harry's shoes can choose to play as The Boy Who Lived himself, or scan their likeness into the game and see themselves on screen. 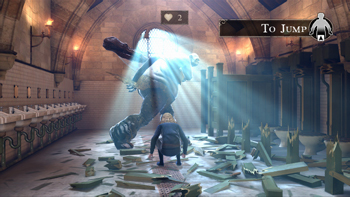 The Kinect will allow players to use gestures and voice commands to control Harry as they interact with memorable locations and characters, including a trip to Ollivander's Wand Shop and a duel against Draco Malfoy. Notably, the press release for the game's announcement says that the game is based on the Harry Potter films and not the book series, suggesting that the content omitted in the book-to-movie transition will also be omitted here. Also important to note is that Harry Potter for Kinect's gameplay will be minigame based, with cutscenes bridging the gaps between new challenges. Given that EA's attempt to make a Kinect-based Harry Potter experience with traditional gameplay mechanics was abandoned after only one try, this may not be such a bad thing. Harry Potter for Kinect will span all eight movies and is planned for a fall release.